Pietro Berrettini, better known as Pietro da Cortona after his birthplace (1596–1699) was the most charming of Tuscan Baroque painters. He went to Rome, where his Grand Manner made him especially popular among Tuscan patrons, and where he created his fabulous ceilings in the Palazzo Barberini. 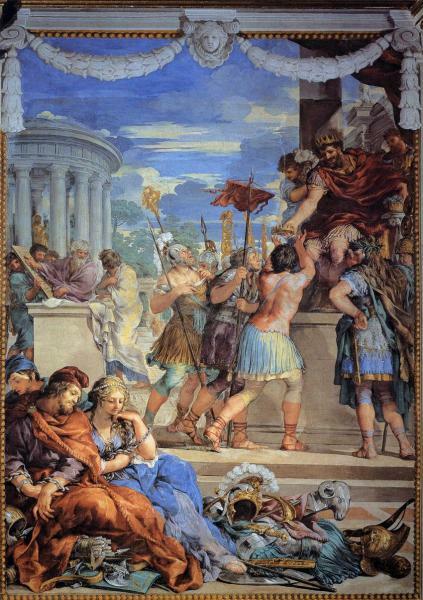 In 1637, while visiting Florence, Pietro was commissioned by the Grand Duke Fernando II to paint some florid ceilings in the Pitti Palace: the Four Ages of Man in the Sala della Stufa and the five Planetary Rooms, including the Room of Jupiter, the former Medici throne room, in what is now the Galleria Palatina. Also see his large painting of the Martyrdom of St Lawrence in San Gaetano.